New details on the game formerly known as Banjo Kazooie 3 and Banjo Threeie have emerged courtesy of Game Informer and GameReactor, both via message board NeoGAF. Rare's latest Xbox 360 venture, Banjo Kazooie: Nuts and Bolts, won't strictly follow the traditional gameplay of the previous two colorful platformers, but will have a heavy focus on vehicles and vehicle building. According to alleged details from the latest Game Informer mag—the same issue posted about earlier—the game will feature some 1600 vehicle parts and weapons with which one can customize their ride, from bikes to karts to planes. 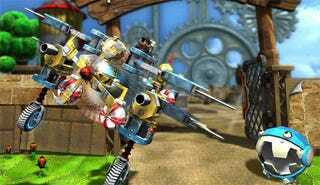 A poster, who appears to be from Danish gaming site GameReactor writes that vehicle creation is similar to building with LEGO blocks, that players can edit their creations at any point. The poster explains how a truck creation was incapable of delivering the required amount of coconuts to finish a level, but that a helicopter more suited to coconut carrying was. In other words, if coconut schlepping is your thing, Banjo Kazooie: Nuts and Bolts will fit the bill.